This sandwich is my least favourite so far. That doesn’t mean I don’t like it, it just has many competitors. And not because it isn’t good, it is. But I think it would be so much better in the summer time with really ripe tomatoes. Tomatoes in the middle of winter aren’t really great. It is so generously filled that I had trouble getting it to stand up to be photographed. The bacon is scarily good both and texture and taste and the mayo and cheese are great. It is the turkey I’m a bit ambivalent about because it has that slight underlying gluten flour flavour which I don’t like (ok, so I am fussy). It is quite exposed in this sandwich. I think the really ripe tomatoes would help, so I’ll be giving it another go in summer. I’m waiting for the summer too before getting the sandwiches with tomatoes– all the market/supermarket tomatoes over winter have been on the blurgh side. Carry on! I’m really loving your MoFo theme, Rosalie. I’m so glad you went with it, even though they had all the new guidelines, or suggestions, or whatever they are! These reviews are going to make it much easier for me to choose next time I visit Smith & Deli. Whenever I’m going to pick up sandwiches, the kids and I spend about 45 minutes reading the menu, because we just can’t decide. (and then I get texts to say they’ve changed their minds!) I’ve only had 3 of their sandwiches. I’m waiting to see what you think of my favourite, so far. You haven’t covered it yet. I’m intrigued as to what your favourite is. I have about 5 so far. Some I have eaten more than once, even though I should be pressing on with the research. I’m down to what I would consider my least likely to choose last 10 and I have been really surprised by a couple I didn’t expect to love but I did. Stay tuned. I just rebelled on Mofo, I had invested far too much time, money and calories in the theme to abandon it. They seem to have relented anyway. I really like club sandwiches, but I have had some pretty good ones (including the one from Wayward earlier this year, which is the best club ever), so I can probably knock this one off my short list for October. 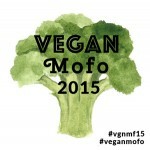 Happy Vegan MoFo and congrats on being featured for last weeks round up! I’m over at http://MyBlissfulJourney.com if you want to swing by I would LOVE it!